New Horizons performed a slight course correction yesterday, a short maneuver designed to correct the spacecraft’s arrival time – a year from now – at the precisely intended aim point at Pluto. The first commands to perform the thruster burn were transmitted to the spacecraft on July 11, and adjusted slightly on July 14. The 87.52-second burn, which sped New Horizons up by 1.08 meters per second (about 2.4 miles per hour), used about a quarter of a kilogram of fuel – less than one-half of a percent of the approximately 53 kilograms still onboard the spacecraft. While the maneuver itself happened onboard the spacecraft at 10:45 p.m. EDT on July 14, data indicating that the burn went as planned arrived in the New Horizons Mission Operations Center at APL at 4:30 a.m. EDT on July 15 – after traveling nearly four hours from the spacecraft, which is nearly 2.7 billion miles from home, through NASA’s Deep Space Network. It was the spacecraft’s sixth course correction maneuver since launch in January 2006, and the first since 2010. New Horizons mission design team lead Yanping Guo, from APL, noted that the maneuver marked the first change in the Pluto encounter trajectory since 2008, now that the team has better information on the predicted locations of Pluto and its largest moon, Charon. “That information is critical to making sure the sequence of science observations, which will be programmed into New Horizons’ computers, goes exactly as planned,” Guo said. Holdridge added that New Horizons will take images of the Pluto system as it approaches Pluto, beginning early next year, and navigation and flight dynamics experts will them to design additional maneuvers to further refine the spacecraft’s course. 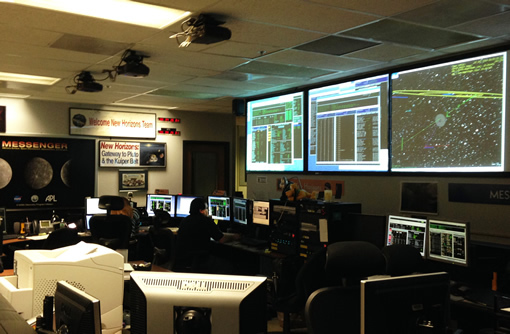 Flight controllers in the New Horizons Mission Operations Center at the Johns Hopkins University Applied Physics Laboratory, Laurel, Maryland, monitor the Pluto-bound spacecraft on July 15 after the course correction maneuver.